Last night's dinner was so delicious that I thought I should share the recipes. I'm an intuitive cook and generally just make up recipes based on what I find in the refrigerator and cupboard. Sometimes I'll consult several recipes and combine the elements that I like, but it's rare that I follow a recipe exactly, even the first time I make it. This method of cooking works well for me. I taste as I go, of course, and am generally happy with the outcome. The downside is that I often can't recreate it later because I don't write down the recipe. When something is really good I'm trying to get better at documenting it. So, here goes. The meal was centered around a jar of preserved lemons that my friend Deirdre made and gave me for my birthday back in March. There are a lot of recipes for Moroccan chicken with preserved lemons, but I wasn't in the mood for lemony chicken. Instead I wanted the side dishes to focus on the lemon. 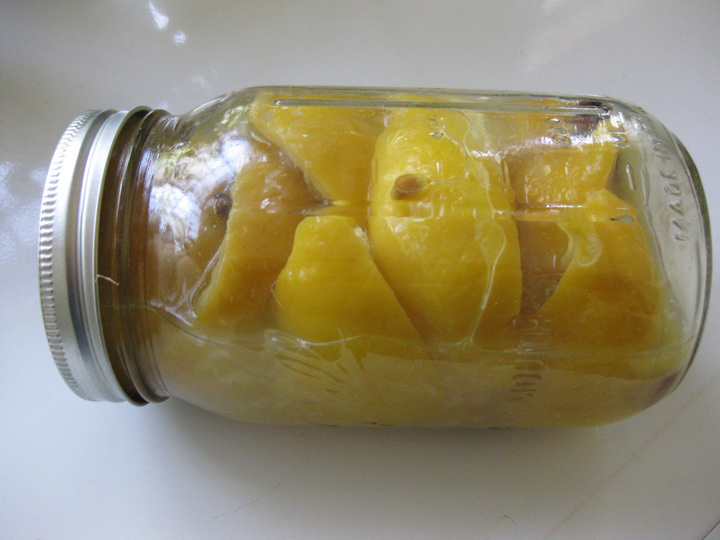 If you want to make your own preserved lemons there are recipes all over the web, like this one. If you don't want to bother, just substitute plain lemon rind and add a bit of salt to substitute. It won't be quite the same, but it'll still be tasty. Preheat oven to 375º F. Rinse you chicken with cold water and pat dry. Place breast side up in a small roasting pan. Make sure to check the cavity of the chicken for giblets, and remove. Blend the rest of the ingredients together and rub over the surface of the chicken. Gently separate the skin from the breasts with your fingers and spoon some of the mixture between the meat and skin. Truss up the legs and wings with twine to keep them close to the body of the chicken. Cook for an hour to an hour and a half until skin is brown and crispy and chicken is done. When there is about an hour left to cook add the vegetables to the pan, check for moisture. If it looks a little dry you can drizzle a little more balsamic vinegar on top of the chicken or add a tiny bit of water to the bottom of the pan. Toss the carrots with the olive oil, lemon and pepper and add to the roasting pan surrounding the chicken for the last hour of its roasting time. In a medium sized mixing bowl, mix couscous, nuts, raisins and lemon rind together and then pour boiling water over. Cover with a plate for five minutes. After all the water is absorbed and the couscous has swollen, fluff it up with the tines of a fork and add the chives and arugula and toss to combine. Serve with a little bit of the pan juices from the roast chicken drizzled on top. Having typed that all out I realize that it looks long and complicated, but it really wasn't. 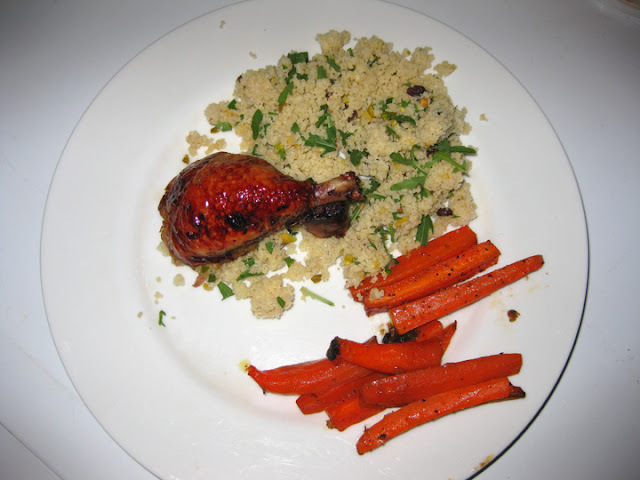 Total prep time for the chicken was less than five minutes, ditto for the carrots and couscous. The rest of the time its just in the oven. Let me know if you try it, and tell me what you think! Hooray!! I'm glad you tried the lemons and that they worked!! What a delicious looking meal. I adore the idea of preserved lemons as a birthday gift! I'm a big lemon freak, and often think to myself, "Hello SELF! Why do you not have a jar of lemons preserving at this very moment?" It's not difficult, you just have to DO IT already! Kudos to your pal for treating you right.